Вести.Ru: Washington NOT Moscow Keeps Upping the Arms Budget; 2019 a Record Year for Pentagon! Washington NOT Moscow Keeps Upping the Arms Budget; 2019 a Record Year for Pentagon! The Ministry of Defense has compared the defense budgets of Russian and the US. It turned out that the difference in expenditures has been growing for several years in a row. What will Moscow and Washington spend money on? Arseny Molchanov has the details. He's live with us now. - Hello, Arseny. Will the Pentagon receive a record amount for national defense yet again? - You're correct. Defense expenditures will be the highest ever in 2019. The budgets for the army and fleet in Russia and the US were studied by the Ministry of Defense. It turned out that the difference increases every year and the US's expenditures will be 15 times higher than Russia's. These figures were taken from the official report. Washington is going to allocate a record $725 billion. This year, they've already spent $707 billion. In comparison, Moscow will allocate $46 billion. If we look at the figures from 2017, it's ten times smaller. However, we should know the relative figures. The share of defense expenditures of Russia's economy and of the USA's economy are practically the same. It's 2.9% of GDP in Russia and 3% of GDP in the US. But the USA's GDP is 12 times larger. This is partly attributable to the number of military bases. The US has bases in 31 countries around the world. You can see them highlighted in blue. There are 13 bases in Asia, more than in any other region. There are 11 bases in Europe. Russia has military bases only in 6 countries: Syria, Tajikistan, Kyrgyzstan, Armenia, Abkhazia, and South Ossetia. Mikhail Khodaryonok, military expert: "Our main goal is to maintain the defensive skills of our armed forces and our country at a certain level because adverse development of the military and political situation is still possible. To some extent, this possibility is even growing. It's especially connected with the events in southeastern Ukraine". There's also a comparison of new military developments in the report. 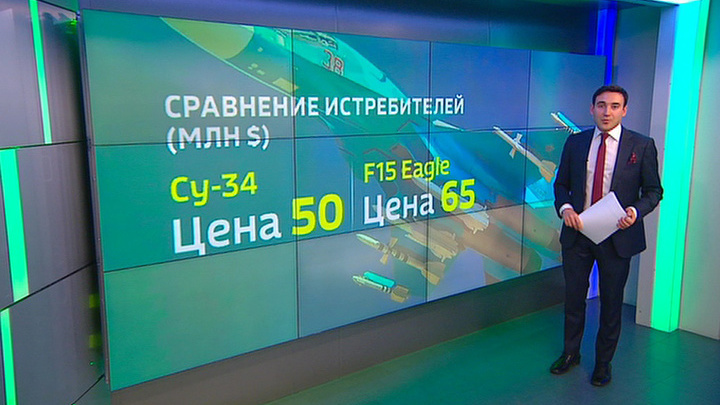 For example, the Su-34 and F-15 Eagle fighter-bombers were compared. According to the Ministry of Defense, the Russian aircraft can detect targets at a 40% further distance and cost less. They cost $50 million, compared to $60 million. Take submarines. Let's compare the Yasen-M and the Virginia-class submarine. They say that the Russian one has 2.5x as many torpedo tubes and launching systems and costs 1.5x less. The price was also mentioned when comparing the Armata tank and the Abrams. According to the report, it's 40% cheaper and has better specifications. It has a 30% longer operational range, and its armor is 25% stronger. Vladimir Shamanov, Head of the State Duma Defense Committee: "We've managed to continue to evenly develop each of the branches and services of the Armed Forces. Our nuclear triad has achieved a record result of 82% of equipment being modern. As we all know, it's the main guarantee of our security". This year, the armed forces received 2,200 units of new equipment. According to Defense Minister Sergei Shoigu, the target of the re-equipment of the ground forces has been outstripped by over 2%. The shares of new equipment differ in every branch of the armed forces. The largest share is at 82% in the Strategic Missile Forces. It's at 74%, a bit less, in the Aerospace Forces. It's at 55% in the Navy, and 46% in the Ground Forces. So, it's at 61% on average. In 2019, they want to increase the share of new equipment to 68%. Talking about long-term strategic goals, the country's authorities mentioned several tasks. They're the improvement of the command, communications, intelligence, and electronic warfare systems, and the usage of digital and AI technologies, robotics, and UAVs. - Thank you, Arseny. That was Arseny Molchanov with the comparison of Russia's defense expenditures with the USA's.